Please note that for orders that are needed within a timescale less than two weeks there is a priority charge of £20. P&P from £5.99 recorded 1st class delivery. To have your guests' names printed in the invitations or on the place cards, or to have the invitation envelopes printed with the addresses of your guests there is a flat fee of £10.00. A dicount will be given for two or more of these options. Save the Date cards can be made with magnets on the back to stick on the fridge for an extra 30p per card. Reply Cards are in the style of postcards, with your address on one side and blank on the other ready to be filled out and popped in the post easily, Or supplied with a blank envelope. For orders that are needed within a timescale less than two weeks there is a priority charge of £20. All designs are available in any colour and the bespoke service means you can have your own designs and ideas incorporated. An informal consultation is offered to all who make an enquiry and portfolios can be viewed by appointment in the comfort of your own home. All prices include invitation text printing and blank envelopes. 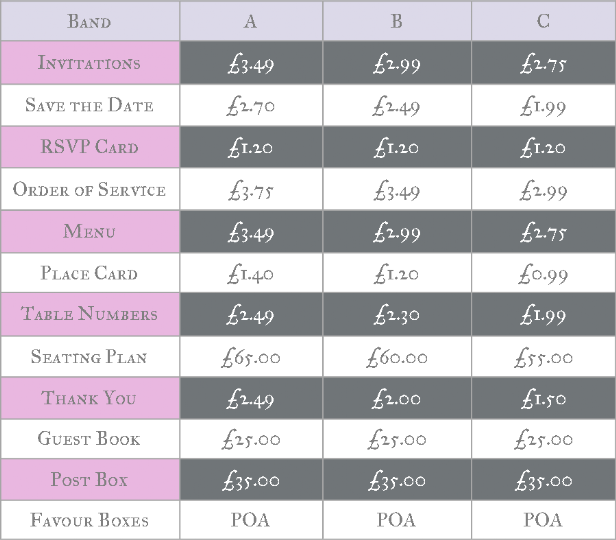 Prices are very competitive and I will try to match other handmade stationery within reason! If you have a budget set out for your stationery then we will also try our best to keep the cost within it by making adjustments in design or materials.